Watlow’s integrated multi-function controllers decrease design and assembly time, require less space, minimize system complexity and best of all, lower the total cost of ownership. Integrated multi-function products are modular and consistent in features, capabilities and specifications across the range of models. Using this product family helps users adapt to changing requirements because options can be added and models can be switched with minimal investment in learning, design, documentation, startup, commissioning and training. EZ-ZONE®controllers allow control loops and limits to be added in single increments as well as a variety of power switching options. They also allow for easy transfer of wiring from one product to another (consistent termination labeling). The Watlow EZ-ZONE PM Temperature Controller offers control options to reduce system complexity and the cost of thermal loop ownership. You can order the EZ-ZONE as a PID controller or an over/under limit controller, or these functions can be combined into an integrated controller. With the EZ-ZONE PM, you now have the option to integrate a high amperage power controller output with a high-performance PID controller and an over/under limit controller in one space-saving, panel mount package. A number of serial communication options are available to the EZ-ZONE PM to support your connectivity needs. Available in 1/32, 1/16, 1/8 and 1/4 DIN panel mount packages, the EZ-ZONE PM is highly scalable and you only pay for what you need. If you are looking for a PID controller, an over / under limit controller, or an integrated controller, the EZ-ZONE PM will make your life easier. The integrated control loop solid state Watlow EZ-ZONE® ST temperature controller offers complete thermal system control in a single package solution. 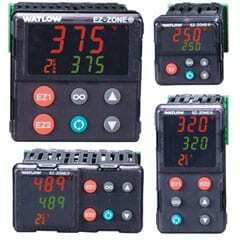 With the Watlow EZ-ZONE® ST controller, you get a PID temperature controller already connected to a high amperage solid state relay. You also have the option of adding a properly sized heat sink, an over / under temperature limit, a shut-down power contactor, digital communications, and a remote user interface to the Watlow EZ-ZONE® ST temperature controller. Your life just became a whole lot easier when it comes to solving the thermal requirements of your system. 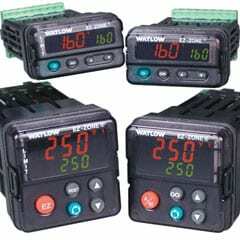 Because the Watlow EZ-ZONE® ST temperature controller system is modular and scalable, you only pay for what you need. You can stack the integrated thermal loop Watlow EZ-ZONE® ST temperature controller into multiple configurations to give yourself the flexibility to standardize on the product’s platform to solve your wide range of application needs. The Watlow EZ-ZONE PM Express controller is an industry leading panel mount PID controller that allows for optimal performance utilizing simple control and menu functionality without complex features. 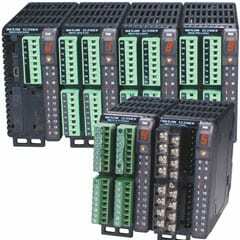 The EZ-ZONE PM Express controller is ideally suited for basic applications and usage levels. The EZ-ZONE PM Express is the next generation of controllers leveraging the strong legacy of Watlow’s SERIES 93, SERIES 935 and SERIES SD controllers where easy-to-use features are needed for basic applications. It includes one universal input and the option for up to two outputs and is available in 1/32, 1/16, 1/8 or 1/4 DIN panel mount packages. 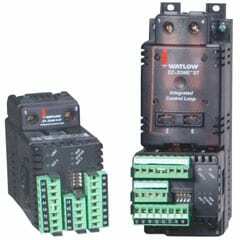 The EZ-ZONE PM Express can be ordered as a PID process controller or a dedicated limit temperature controller. If you are looking for a simple and easy-to-use basic PID controller or an over and under limit controller, the EZ-ZONE PM Express will be the ideal controller to use. The SERIES EHG® SL10 integrated, multi-function controller is a key component to a powerful system that integrates a heater, an adjustable set point temperature controller, a high/low temperature alert, a power switching device and a high temperature safety limit. 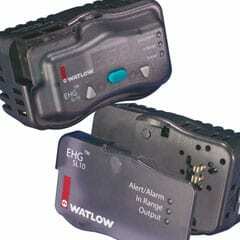 Its agency recognized controller/safety limit meets UL® 1998 and CE 60730 requirements. An optional display/communications module can be easily added in the field to provide a digital display indication, adjustment of set point, RS485 Modbus® communications and other Human Machine Interface (HMI) features. As a scalable system, only what is needed can be purchased. The EHG SL10 controllers’ easy to install, compact design, inherent reliability and integrated limit functions offer unmatched value. It is designed for easy integration with Watlow heaters to simplify engineering, reduce component count for new equipment and decrease ownership cost. For original equipment manufacturers, (OEMs), CE, SEMI-S2 compliance and UL® recognition, the EHG controller reduces time and costs associated with global agency testing and validation. Many applications requiring a fixed temperature set point rely on a mechanical thermostat for thermal control. Thermostats have proven, however, to be inadequate for many applications due to long-term reliability issues, such as 100,000 cycle rating and poor temperature control. The SERIES EHG® thermal solution includes a compact temperature control, thermocouple sensor and power switching device integrated into the heater’s power cord. The SERIES EHG temperature control and sensor reduces system costs and lasts substantially longer than a conventional thermostat solution. 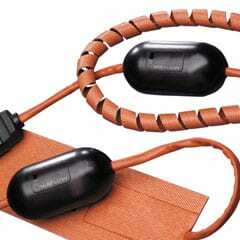 The evolution of miniature microprocessor technology and Watlow switching technology fostered development of a small, versatile temperature control and thermocouple sensor that is integrated with Watlow silicone rubber heater products. This device senses the temperature via input from a thermocouple strategically placed on the heater mat. The microprocessor is programmed prior to shipment with an application specific set point. This results in quick delivery of a custom, integrated system.